Oisin Smyth scored the winner for Dungannon Swifts at Coleraine. 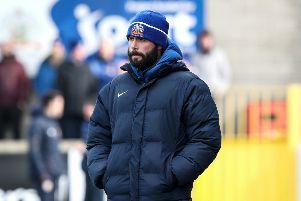 Dungannon Swifts maintained their excellent start to the year as they picked up another three points at Coleraine. Goals from Paul McElroy and Oisin Smyth either side of Jamie McGonigle's equaliser gave the visitors a deserved win at The Showgrounds. Teenager Smyth was impressive all day as he picked up another goal for the Swifts. Both sides started on the front foot with McGonigle forcing Alex Moore into a good save from a free kick on three minutes. At the other end Mark Patton somehow missed a gaping goal after Daniel Hughes had picked him out in front of goal. Ben Doherty tried his luck from distance on seven minutes, but it fizzed wide of the target. Chris Hegarty suffered the same at the other end as he glanced Patton's free kick wide on 24 minutes. Five minutes later Daniel Hughes slipped in McElroy, but he elected to cut the ball back instead of shoot and the chance was lost. They did get their noses in front on 32 minutes as Smyth's clever pass allowed McElroy to run free and clip the ball past Chris Johns. The lead lasted only a minute though as Jamie Glackin crossed for McGonigle, who kept his cool to fire past Moore. The Swifts weren't to be denied though as retook the lead three minutes after half time. Smyth started and finished a sweeping move as he got on the end of McElroy's centre. McGonigle was denied another equaliser on 55 minutes as Moore blocked with his feet before he crashed a header off the bar on 71 minutes. Both sides had chances towards the end as the conditions worsened, but it was the visitors who took the points come the final whistle.